You love the infinite creative possibilities. You’re inspired by greats like Joe Pass or Wes Montgomery. That unique, special feeling you get when you’ve finally mastered something incredibly challenging. Or simply the fact that jazz guitar sounds cool and you love the music. What motivates you to keep plugging away at this wonderful instrument, one lick at a time? I thought it would be fun to start a discussion on my website about this. 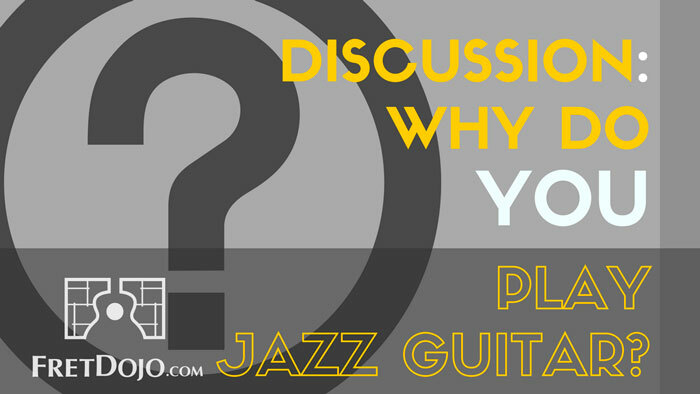 Leave a comment below about what your key motivations are for learning jazz guitar. I play jazz (try to play, am learning to play jazz, in spite of the impossibility of it) because I love the sound of my nylon string crossover acoustic guitar (Buscarino Cabaret). I love the idea of being able to create on the spot. I love the challenge. I love being connected with a tradition. I love being inspired by all of the greats. I love the way it absorbs me and that I can lose hours without being aware of the time. I Play Jazz Guitar because of the magic moments we get into with the other musicians, also sharing this magic with the audience. Hard to get there and hard to sustain these moments, but really worth it. I’m a longtime singer of roots music, but I love the witty lyrics and sophisticated progressions of 1930s-40s pop songs (think Ella Fitzgerald and Joe Pass) . That is what appeals to me about jazz guitar. Also the freedom of expression that comes with improvisation is a major draw for me. I have a few acoustic and electric guitars (and other instruments) , but I find the nylon string to be the most expressive for this kind of work for me. Because I love making vast amounts of money from the hundreds of gigs I get. I play jazz for many reasons. When I started to learn guitar, all the scales etc, I did not anticipate going in the jazz direction. My instructor played professionally for 20+ years in the jazz arena. I was just taking lessons to learn the instrument, learn some songs, get to a point where I know longer needed lessons….etc. He is a great instructor. Very patient with me. One day during a lesson my instructor asked the question of what I wanted to focus on. It was then that I chose to pursue Jazz. I really enjoy Jazz. It is soothing to my stress. Very warm to my soul. In addition, I love the challenge of learning. The study of Jazz is so in depth that I can spend the rest of my living life learning. Thanks to instructors like yourself, I can learn at an easier pace for myself and no longer put that extra undo stress on myself to learn faster. I just let it happen now! I am interested in jazz guitar only as a means of advancing my theoretical understanding and my ability to play other styles (except classical). Learning the old jazz standards gives me no pleasure at all. Modern stuff would potentially interest me, however. I still say that Jazz is the hardest thing to play on the guitar. Rock is easy. Country is easy if you can get your thumb into rhythm. Blues has to be lived. Like Flaminco has to be felt to be played right. to old age. You have to grow into Jazz. I like the early Jeff Beck. A great teacher and great player, Walt Namuth. Thanks for your comment Jim! I haven’t heard of Walt Namuth – I’m looking but can’t seem to find much info out about him online. Any recordings I could check out? Well, for one thing, it keeps me sane. I hesitate to think about life without playing. With apologies to the great Harry Chapin: “But music was his life, it was not his livelihood, and it made him feel so happy, and it made him feel so good. He played from his heart and he played from his soul. He did not know how well he played, it just made him whole.” That’s me. I’ve been playing for over 60 years. Good times, good friends, good life. Although I play a number of different styles of music on guitar, the study of jazz has probably taught me most about the apparently limitless possibilities of this amazing instrument. I am an old 3 chord wonder that picked guitar up again after a 30 year hiatus. I am learning music theory and trying to read notation. Jazz is the natural progression of my study. Cool to listen to; challenging to grasp the complexities. jazz is part of my retirement plan!!! I am lucky enough to be able to play weekly with my Jazz Trio here in California and yes. I get paid to do it. I am also a song writer in the Jazz realm. I will be publishing 10 new tunes in a few days. Oh and I love it. Hi Greg; what a nice question You brought up! You know at the end of the sixties I started playing Dylan, Donovan, CCR, the Beatles etc. Then I switched to listen to nothing but electric jazz type Wheather Report, Miles Davis. To play that stuff was too big of a challenge. In the nineties I started to listen to Jim Hall. He played smoothly, almost poetically what I like(d) very much. In addition, he was not that fast!!! So, i thought I could do that. Obviously, I never achieved that. But that was a start to dive deeply into this world of jazz guitar which makes me kind of happy… And your lessons help me a lot in that! When you have had a bad day, immerse yourself in practising the guitar or any musical instrument. It changes your entire disposition; it brings a calmness, particularly if you are working on a particular exercise which requires concentration. You forget the world and tend to get so immersed that only the task at hand matters. At the end of your session your thoughts are only on “What progress have I made?” And your thoughts are now on your next session and not on your earlier troubles. Music undoubtedly calms the soul. I love the sounds and unlimited potential of jazz and on the guitar there are so many styles to take from the possibilities are limitless. I was in college, playing 12 string guitar in a contemporary Christian group; the lead guitarist introduced me to Mikey Baker’s Jazz Guitar book. I think I got about 6 pages into it, but learned so many “jazz” chords that I felt like I was playing a new instrument. 20 years later, it was time to branch out. Got a Geo Benson GB10, and had both a new instrument and a new inspiration. 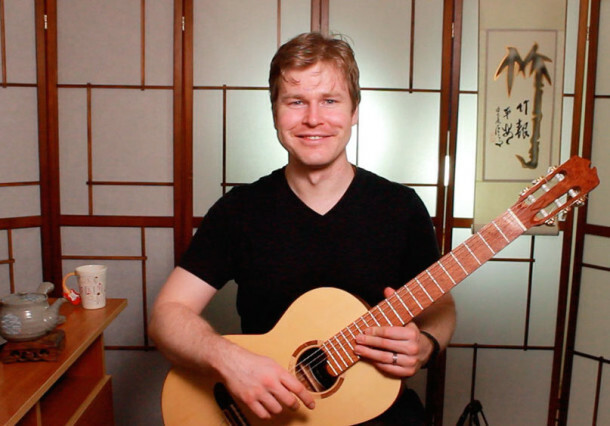 I had also learned how to read music for mandolin and mandocello, it was time to tackle the challenge of Jazz Guitar! When serving in the US Navy a shipmate told me about Kenny Burrell..
That was it..I was hooked….my first album was Midnight Blue…and I play it still once or twice a week..have come to learn to play all the songs on the album..
Then I found out about the likes of Wes…Joe Pass…Howard Roberts..Tal Farlow…Herb Ellis…Charlie Byrd…and all the others including Barney Kessell..
Been playing more than 50 years…side tracked over the years playing rock and country…but the passion is still jazz guitar..
Like higher mathematics I enjoy the challenge…it’s not the destination but the trip to it.. I have been playing guitar intermittently for many years, mostly blues and rock. My son started playing acoustic bass and studied jazz in college. He is now a successful jazz bass player in NY. I was exposed to jazz through him and his friends, and became interested in playing jazz guitar. I retired last summer, so decided it was time to really start to learn. I enjoy playing, and the mental challenge will be good for me. Always learning something new! I wish I knew. I think its because I enjoy self torture. Ha. Today is one of those wewdays that arnt going so well in practice room.ha. broad spectrum of expression, which also makes it frustrating. I’m into personal compositions as I can’t relate to a lot of real book stuff. As a result I’m trying to hack out my own thing. I enjoy every aspect of improvisation,composition. I study jazz for the love of the music , swing blues and great melodies. Studying jazz guitar allows for melodic invention and a deeper understanding of scales , chords and harmony. This understanding can be applied to all types of music.You see Tuck Andress , Joe Pass, Martin Taylor and other taking any tune and making masterpieces of solo guitar wow! Hi Greg, it is a very good question and by chance I’ve been thinking of and the answer appeared in a very natural way when I started playin jazz. I used to play bass before in rock and funck bands. I play Jazz for the feeling I have at the moment when I make one with the band for only one goal : build a common free expression based on each individual one. At this time I feel to participate to something bigger, a total free improvisation based on a minimum rules, to express a feeling or a story I imagine due to the current immediate musical context. This is why I play jazz, this is why I work jazz, for these few live moments playing and going somewhere you can renew each time you play. As I’m french I hope my english is enough understandable to express my feeling. Thx for all you do for us. I endlessly love to hear myself play. I like the mental challenge of weaving notes through cord changes. Not very good at it but enjoy trying. I play jazz for many reasons. I love its complexities and richness. I particularly enjoy chord-melody style because I can play whole tunes by myself that sound full and rich. It’s an activity that totally absorbs me, and thus helps me shut out all the other “noise” from work, politics etc. It’s great for my brain, and as a psychologist that’s really important to me – lots of research to show that learning an instrument (particularly one as complex as jazz guitar) helps buffer against brain degenerative diseases (such as alzheimers). Plus I just want to work out what all those smart-arses are doing! I love jazz, because, as a girlfriend said, it is not just playing music, it is playing WITH music. And I would have preferred to play the trumpet as Miles or Chet Baker, but it is technically more difficult than playing the guitar. And my profession as a Doctor takes a lot of time, plus I have a family that requires my time, too. i started playing guitar when I was about a 13 yr old, cos I wanted to sing. learned a few chords and having done that strove to get better. I am still doing that, solo and duo, have’nt done too bad, but never was happy with my playing guitar. so looked to improve on good chord knowledge but sorely lacking in theory and technique. I could barely play a scale. started to look at anything that would guide me into the Improvement zone about 6/7 yrs ago. always enjoyed most of guitar based music. found JAZZSCHOOL UK. what a revelation!! soon joined a big band playing standards. both of these have pushed my ability upward, and regularly gig now. there is still way more for me to learn but feel definite improvement. I think you need the desire to do it and put in the hours. meanwhile back to the woodshed……oh! did I mention…..i’m 75 yrs old!….. still loads of time. Frank Zappa said “I started getting interested in jazz guitar around age 20 but they were not playing what I wanted to hear”. What is good for Frank Zappa is good for me. I am NOT motivated by envy. There is no guitarist that I want to sound like, though, I am inspired by many. Every guitarist with adequate facility on the instrument does things worthy of note. So, one can learn from anyone. It’s interesting to note the differences. Some players are more scale oriented, some are more arpeggio oriented, some enjoy wide intervals, others like to connect and resolve chromatically. I was attracted to guitar because of the bell-like acoustic/electric sound. The CLEAN tenor-alto range with so many options in articulation and phrasing. When I hear players over-doing the effects, hiding that awesome sound, it makes me very sad. I wonder if they know how close they come to being easily replaced by an electric keyboard. I love this beautiful music because it is the the symbol of world peace. Allan Holdsworth makes me dream, and so do John Mc laughlin, Pat Metheny, Wes Montgomery, John Scofield and so many others. God bless you all! Lots of good reasons in these comments. For me, I played west-coast stuff (Crosby, Stills, Nash, say) in high school, but never studied anything seriously, then abandoned the guitar when going to college, and … picked it up 30 years later. “Funny” to start again and this time seriously, on such a difficult topic. But it’s a challenge and rewarding too. I love the swing of it, the interplay of comping and soloing, nd the mistery of matching (sort-of in my case) chord changes. Besides, there are many subgenres -think of blues of course, and gypsy. For example if I feel like blues-izing every now and then, that’s still jazz. And I can export my jazz feel into other thigs I play. Great experience all in all, although I am really still a beginner. I’m 73. At the age of 16 I heard a rock-n-roll, and I like it so far. At 19, I heard Frank Sinatra, and I like it so far. At 22, I became interested in Gypsy music (folk), and this passion was enough for me just 10 years. At 24, I heard a jazz trio (guitar, piano and bass), and this music I like so far. At age 62 I decided that I must not only listen to jazz, but to learn jazz, I study jazz guitar and piano, and will do so until the end of my days. I love it! At 54 I just figured out after hearing Cliff Fredericksen play beautiful chord melody at Lilliana’s in FItchburg WI, that it was what I really wanted to learn on guitar. For the last year I’ve started from scratch. Slowly making progress but I want to be one with my guitar and play sweet chord melodies. How about a lesson (or series) about transitioning from pop music (R&R, Blues, Country whatever) to Jazz? There are SO Many directions to go in from playing standards, bebop, swing, fusion, avant garde, free jazz, etc. etc. We can be eternal students; or at least lifelong students. I love improvising with other open minded players to being part of a tight rhythm section for some funk flavoured “jazz”. I also love to teach and pass on any knowledge I can to others. I’ve been playing guitar/music for 40 years and there’s so much more I want to learn. I feel like I’ve only scratched the surface. Wow – what great comments everyone! It was a pleasure reading through your responses, I can really resonate with your reasons you play and I enjoyed hearing your stories of your journey you’ve taken with jazz guitar. Thanks so much for contributing – I appreciate you! I have been playing guitar for a total of 17 years. However, there was a four decade pause between year twelve and year thirteen. I started out with the folk music of the 60s. Second time around, I started studying music theory which took me to the blues and then, inevitably, to jazz. I have always had a deep appreciation for the Great American Songbook. So, as music theory and the blues permeated my being, jazz was inevitable. I am 70 years old. Retired. I practice 2-3 hours a day. Jazz is so simple and yet, so complex. Playing this music lifts my soul. I also play and sing in a duo doing folk, folk rock, classic rock, etc. lots of fun. But not as enriching as jazz.